In this episode, the panel discusses the perks of purchasing Tables in Wonderland, a discount card used for Walt Disney World dining. RE: getting an AP, if you stay off property, it's even more valuable as you get free parking at the parks, plus the included memory maker. At about 9 days, it pays for itself. great topic for a show! 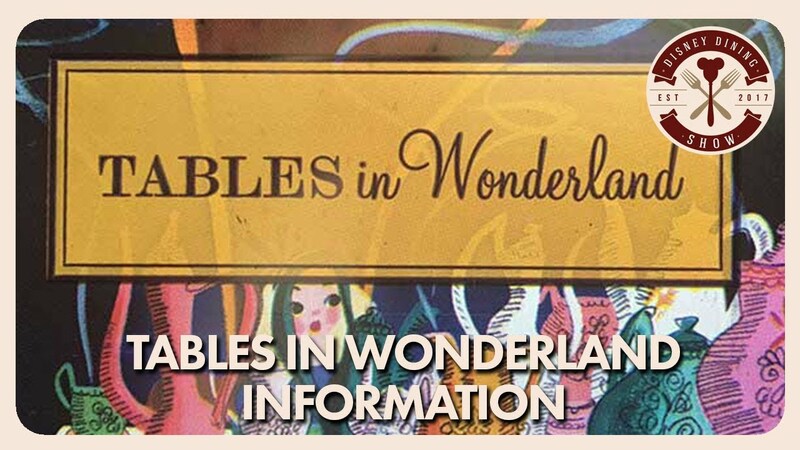 one question, is Tables in Wonderland able to be used at any of the epcot food festivals at the kiosks? We love having Tables in Wonderland. This is our first year as APs and this saves our family of 6 a fortune. Between the merch discount on the AP and food on TiW our memberships have paid for themselves already this year. Love you guys and all the new content! Is the card still good for 10 total persons? Man, this time last year we went to Jikos for the first time and took advantage of the limited time offer of 30% off dinner for Annual Passholders… It was such an awesome deal. Fabulous topic! Does anyone know if this is restricted to US residents or can UK 🇬🇧 guests also purchase AP & Wonderland passes when they get to the parks too? One of the best values for DVC along with the required annual pass. Disappointed that Victoria and Alberts no longer accepts. Have not been back there. I've seen so many Videos of Families using this and I've NEVER known what it is. Thanks for this Info. I'm not a Florida Resident or annual Passholder so this doesn't apply to me. We may become an AP eventually. Super interesting show. One more thing to ponder for our next trip! Thank you SO much for this. As DVC, I was curious if this was something for me when I visit WDW. We're Florida Residents, and during the early days of our visits I would regularly get Tables in Wonderland. Back then it was only $50! We'd often go twice a year, using the Florida Res Seasonal pass saving us even more. However, these days when my wife and I visit by ourselves once a year the benefits usually doesn't justify the expense. I must note that we can now take advantage of the Armed Forces Salute Tickets each year as well, a significant discount over gate prices and other passes. Steve comments at the end though still bear ear consideration. It may be possible for us to schedule trips and take advantage of TIW, we just need to do that math! Although I know it might be more economical to get an annual pass over regular park tickets for two trips but the issue for us is the upfront cost. We usually book a trip and spend 5 or 6 months paying on it. My understanding is you have to pay up front for an AP if you aren’t a Florida resident. That is a large chunk of change for a family at one time. It's worth noting if you aren't already an annual pass holder you can't look at the pass holder room discounts on the official website. so you would have to look up the discounts on a third party website or go through a friend with an annual pass or travel agent who can look at those deals and see if they apply to where your staying and when you're going. What about on a 10 night stay for 2 adults with 6 table service meals and 10 day park hopper. Is AP and Tables in Wonderland worth it? Like others have said – free photopass is a huge bonus with an annual pass. TIW definitely works for the way we Disney. We have to go 3 times a year to make our Annual pass worth it. RIght on Steve! Coming back within the year for your vacation is worth the AP purchase. I am trying to decide if I should purchase the Tables in Wonderland. I am there for 12 nights in December, a week in April and another 12 nights December 2019. Thank you for discussing this! I tried looking up Tables in Wonderland online, but cannot find where to purchase it. Could you point me in the right direction? Thanks! It was only a few years ago that the DVC price for TIW was less than $100. Now that was a bargain. THANK YOU THANK YOU THANK YOU! We have been laboring over the decision to go annual pass w/Table in Wonderland, and you've helped us to feel good about our decision to do it! One question that we can't seem to find the answer to is this – We have 11 people in our party for our Dec trip. I know that the single card covers a total of 10, but what happens when we have 11 people and present the card to the server? Will they discount 20% on 10 people's meals? Or will they not accept it at all? I'm actually really excited to get this info because it's one of the few things I really know nothing about when it comes to Disney vacations. I agree TIW is definitely worth it even with the discounts for DVC and annual passes.